So- what's your life shifting story? You know, that story that changed you to your very core...let you know that since it didn't kill you it would make you stronger. And how does it help your business? Maybe you are still working your way into the fullness of the lessons you received during that time. That's a perfect place to be. I can help you get to the other side and show you how to craft your story in such a way that your clients find you! I've traveled the world presenting my story in a one-woman stage show (My Brooklyn Hamlet), speaking on the message of my story (forgiveness and using our stories to live on purpose) and leading self-forgiveness workshops and story workshops for audiences as diverse as women prisoners, youth-at-risk, the US military, for peace centers, grad students and spiritual communities. I've acted in film, in commercials, industrials and I've been interviewed on network TV and on local TV, in addition to being interviewed for radio shows, telesummits, for podcasts and magazines. But it wasn't always this way. When my life-shifting story happened I wanted to hide. I was afraid to be seen and fearful of judgment. But- witnessing my story- my full story- getting it out of my head and onto the pages of my journal started my healing. From there a public presentation turned my fear into surrender...and acceptance...that to share my story was brave and to courageously share it would change lives. What I didn't know back then...was that sharing my story would be the foundation of what makes me stand out in my business. Are you dealing with knowing you have to share your story but afraid to press play when you sit down to do your Facebook Live? Do you feel nervous at the thought of putting yourself out there boldly and then being judged? Not really sure how to share your story powerfully and if it's not powerful it could hurt your credibility instead of building it? the CONFIDENCE to express yourself authentically. You won't want to procrastinate- you'll want to share your message from the metaphorical rooftops because you'll know that you are changing lives, inspiring others and building a name for yourself. You won't get a formula with me. I'm more about knowing the formula so you can BREAK it and BE UNIQUELY YOU! I work with the creative within you, the visionary. I share everything with you. << I share boldly, skillfully and creatively to stand out and make the most impact. Think about the leaders today and what makes them stand out...it's their stories. Brendon Bruchard had the car accident that made him look at his life completely differently. Ali Brown had less than $20 in her bank account and couldn't withdraw it from the ATM when she needed it. Suzanne Evans was a secretary in massive debt. Rhonda Britten's father killed her mother and then himself. WHAT'S YOUR LIFE SHIFTING STORY? My own story is one of getting over the murder of my mother by my father and then him marrying her sister, my aunt. My message is about forgiveness, redemption, and recovery. 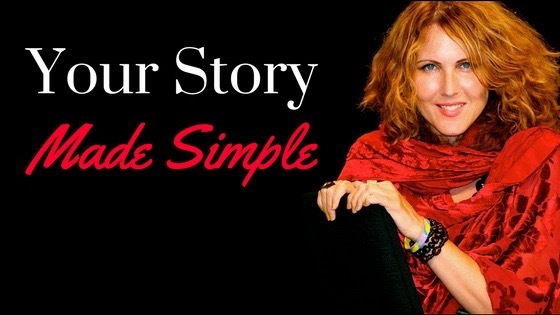 You are going to learn messaging in Your Story Made Simple. Healing my story and then sharing it and helping others was a turning point in my life that was a game changer. We all have that thing that blocks us until we face it, reframe it and share it. so that you are captivating, engaging and commanding to your audiences..
NO PROBLEM. I'VE GOT YOUR BACK. FIND OUT EXACTLY WHAT STORY TO TELL IN SERVICE TO YOUR BUSINESS. DISCOVER HOW MUCH IS TOO MUCH TO SHARE AND HOW MUCH IS JUST RIGHT TO ATTRACT YOUR PERFECT CLIENTS. FIND OUT HOW TO CRAFT YOUR STORY LIKE A PRO! that CONFIDENCE comes from knowing exactly what to share, crafting it like a pro and getting feedback from a mentor. You get access to all the training right away. Just one payment of $497 and you have access to the material forever. New extended payment plan offered for a LIMITED TIME! Get started today for just $97. Click here for a 6 pay option! Brenda has traveled the world presenting her life story in a one-woman stage show (My Brooklyn Hamlet), speaking on the message of her story (forgiveness and using our stories to live on purpose) and leading self-forgiveness workshops and story workshops for audiences as diverse as women prisoners, youth-at-risk, the US military, for peace centers, grad students and spiritual communities.